Sold by: Medical Xpress of SWF Inc.
Weighs just 3.5 oz (100 g). 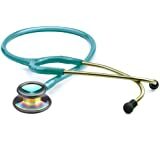 Five-year warranty and free \"consumables,\" including diaphragms and eartips, when registered. 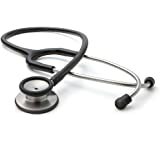 ADC's Adscope stethoscopes are recognized the world over for their unrivaled performance, rugged durability, practitioner comfort, and unsurpassed value. The Adscope-Lite 609 Clinician Series, has affordability, superior acoustics, and an ultra-lightweight design. From its CNC precision-machined aluminum alloy construction to its ergonomically designed headset, the ADC Adscope-Lite 609 is engineered to provide impressive acoustic performance. The combination dual-head chestpiece offers a diaphragm side for high frequencies and a bell for low frequencies. 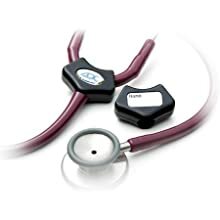 At just 100 grams, the ADC Adscope-Lite 609 is one of the lightest, most comfortable clinician stethoscopes on the market. 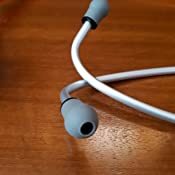 The ergonomic headset wears easily, with our Adsoft Plus silicone eartips providing the ultimate in practitioner comfort and acoustic seal. The non-chill diaphragm and bell retaining rims ensure patient comfort. 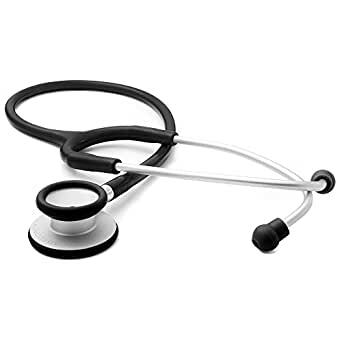 Our Clinician Series stethoscopes are fabricated from premium materials, combining lightweight comfort outstanding acoustic performance, and incredible value. 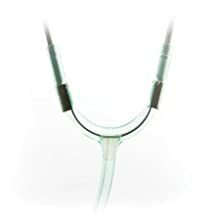 The double-leaf tensioning spring withstands thousands of cycles, and the clinician headset is made with a reinforcing yoke molded into flexible 22-inch PVC tubing. 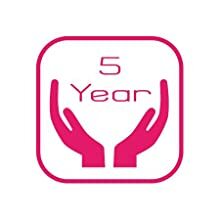 ADC’s five-year warranty ensures you get the most from your investment. You can order free 'consumables,' including diaphragms and eartips, for any registered Adscope-Lite 609. And if your scope ever needs more extensive service while under warranty, simply return it to us for a complimentary refurbishment. 1 3/4" 1 3/4" 1 1/2" 2 3/16"
Personalize your ADC Adscope-Lite 609 by selecting the finish and color that’s right for you. Choose from two metal finishes – aluminum or tactical – and up to seventeen tubing colors, depending on the finish. Your ADC Adscope-Lite 609 comes with a spare diaphragm and one additional pair of Adsoft Plus snap-on silicone eartips in a convenient storage case. All ADC products are manufactured from the finest materials with an uncompromising commitment to craftsmanship and durability. Compare the quality and performance – and, most important, the value – and you’ll discover the ADC Advantage. Every single ADC Adscope-Lite 609 is hand inspected in the USA for fit and finish to ensure it meets the most important standard: yours. 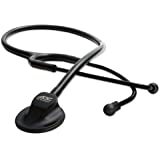 5.0 out of 5 starsThis is a great stethoscope! 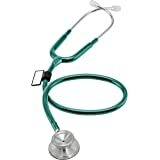 I am an RN and I had been using my basic model Littman for 6 or 7 years until someone walked away with it on my unit. I replaced with this one since I didn't want to spend a bunch of money again. It's lighter and I hear JUST AS CLEARLY with this one if not even more clearly. 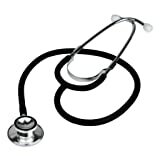 This is a great stethoscope! This is lighter than my Littmann, it's also louder than my Littmann which I was surprised about. What I do have an issue with on this as opposed to my Classic III is that it lets in a lot more ambient sound which isn't the best while working in the back of an ambulance. 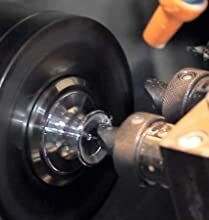 I also find the ear tips to be less comfortable than the Littmann, but for the price, I would much rather purchase a bunch of these and break them rather than lose my Littmann. 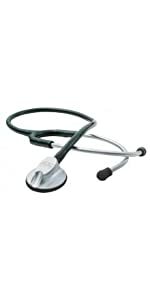 I also got the opinion of my nurse friend and he echoed my views on this stethoscope. Great product. 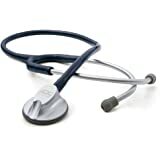 I have bought and used Littman stethoscopes for the last twenty plus years. Recently mine found a new owner :) Based on the reviews and being close to the end of my career I decided to try this brand. I love it. You hear heart and breath sounds very clearly. I also like the different look, it's completely black from ear tips to bell. Excellent product for a great price. 1.0 out of 5 starsIt's a toy?!? 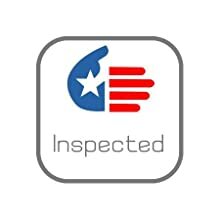 5.0 out of 5 starsGood pick! 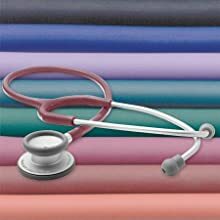 I love this stethoscope - its super lightweight, i can hear a pin drop! It is my #1 over my other 2 littmann's. 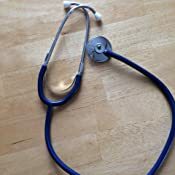 If you have ever had your expensive stethoscope take up residence around someone else's neck; or in my case, lost it in a house fire, you know how frustrating it is. 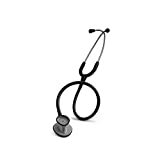 I had a $300 stethoscope, and it was great, but this one is almost as good. This one is also much lighter. 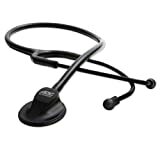 This is a great stethoscope for keeping in your bag, or using in a hospital setting. It will not hurt near as bad if it decides to move on, in fact, buy two so you have a backup. Also, get a weird color, in my years of nursing, I have found that to help in holding on to one. 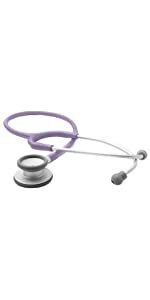 Although I have on more than one occasion retrieved my purple stethoscope from a doctors neck. 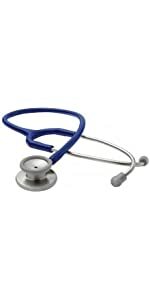 3.0 out of 5 starsAmerican Diagnostic Corporation Adscope 609, Orange, Adult Stethoscope. 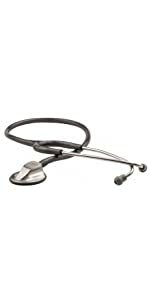 This is just your average everyday stethoscope, but it serves it's purpose. I have both this one and a cardiology quality one. 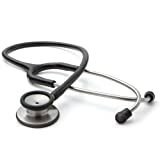 I carry this one around on my neck because it is light weight and is OK for most purposes, but if I need to listen something a little better, I retrieve my other stethoscope, which i keep handy. 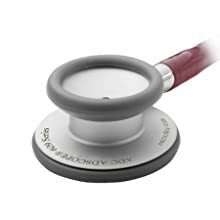 Also, stethoscopes have a tendency to walk away where I work, so I purchased the orange ones, which are highly visible, and usually if i ask around if anyone has seen a bright orange stethoscope, they can go right to it if it is around. If anyone , including the Dr.s ask to borrow a stethescope I hand them this one and keep my more expensive one tucked away when not in use. That way I'm not so worried if it disappears. So far this tactic has worked. It is adequate, though not optimal in some cases. 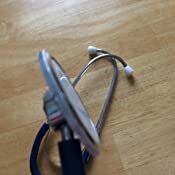 Also, The ear pieces were comfortable to my ears, which is not always the case when you have the economy brand of stethescope.I would purchase it again for basic use. Lavender. Received it today. I am pleased with the color. I tested it out on myself and my husband (I am an RN) and it works great. 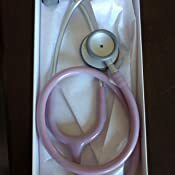 I had a littman that was given to me as a gift in nursing school. Unfortunately it walked off the unit despite having my name engraved on it. I figure for the price, this was worth the risk of possibly losing. The sound quality is about the same as the littman. 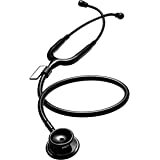 I wouldn't say it's the same or better, but for my needs, this stethoscope is more than sufficient. 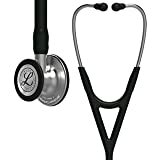 100% would recommend to any RN needing a new stethoscope.